NOVA’s Jacksonville Office is now open! 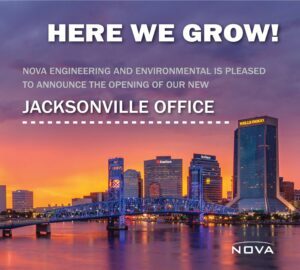 NOVA Engineering and Environmental is pleased to announce the opening of our new Jacksonville office. With more than 30 years of Facilities Consulting and Testing experience, which includes Building Envelope, Roof, Property Condition Assessment, Accessibility and related Building/Construction Consulting, James Keeney will be leading this office and serving as NOVA’s Vice President/Facilities Services Leader.